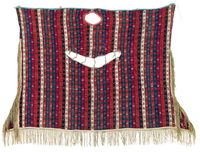 These large "Ghudjeri" flatwoven covers from Afghanistan were woven for home use by various Uzbek tribes. Composed of eleven joined horizontal panels, the example offered here shows a design of continuous, red-and-white and yellow-and-blue stripes presenting diverse geometric motifs, with plain stripes placed between them. The horizontal bands are each between 30 and 33 centimetres wide. The finishes trimmed with fringes were added later, after completion of the cover. – The weaver began by producing a very long band in warp-faced plain weave and then cut it into sections of equal length. The length of the sections determined the final width of the cover. Joining the segments together resulted in the characteristic composition of horizontal stripes with an appearance of rich variety. The jajims woven by the Shahsavan of Azerbaijan and those by the Bakhtiari, Luri and Qashqa’i, of Central and South West Persia respectively, are closely related to Uzbek weavings in terms of technique and design. – Good condition, except for a few small darned areas. A saddle cover composed of several textile panels, slightly wider than it is long. Decorated with narrow vertical stripes in varying colours, the flatwoven fabric panels were probably produced in a Kerman workshop. Openings were cut for the cantle and pommel, and a decorative fringe was added along the sides and lower end. – Persian saddle covers are almost always either pile-woven or flatwoven in the kilim technique in a single panel. This saddle cover is a rare exception in that it is produced from ready-made materials; it may be an early example of recycling existing materials. – Slight signs of age and wear, possibly reduced at the upper end. During the 18th and 19th centuries, the city of Kerman was the most important Iranian production centre of such wool fabrics featuring woven designs, known as "termeh". Created by means of a complex technique, the textiles competed with similar products made in Kashmir, India, and were popular among the higher echelons of Persian society, especially during the reign of the Qajar dynasty. They were often made up into fashionable items of clothing, occasionally used as decorative wall hangings or covers, or worn as shawls (wraps), like this long and extraordinarily fine textile woven on polychrome warps. The elegant design consists of vertical stripes in dark red, golden yellow and white filled with delicate flowering vines. The bands are separated by narrow, dark blue dividing stripes. It is likely that the stripe designs of Sehna kilims from Kurdistan derive from such Kerman fabrics. The white-ground border is clearly influenced by Kashmir shawls. – Minimal signs of wear, good condition. This long textile panel with a dark blue ground displays a design of small botehs arranged in offset rows and interspersed with flowering stems. Woven in subtle shades offering little contrast, the repeat appears rather indistinct, conveying a sense of elegant restraint. A white emblem and written characters have been embroidered onto the lower end. – Good condition. This square shawl woven from the finest Kashmir wool (high-quality goat hair), a so-called pashmina, is composed of several sections invisibly sewn together. Its comparatively heavy handle, silky-soft glossy material and brilliant colours immediately identify this shawl as an Indian weaving. Shawls of very similar appearance were also produced in France, but these were woven in a single piece on the jacquard loom invented by the French silk weaver, Joseph-Marie Jacquard, as early as 1805. – The dense, strictly symmetrical design of large, curved and curled palm motifs as well as many leaves and flowers is conceived as a concentric composition around a black-ground central star. Narrow white bands divide the design into segments and provide a clear structure. 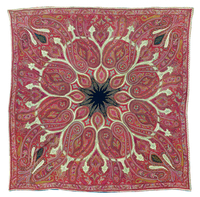 A comparable shawl is in the Honolulu Museum of Art. – Backed with a blue fabric, minimal signs of age, good condition. Composed of several sections and woven from the finest Kashmir wool (high-quality goat hair), this large pashmina belongs to the same type as an example published by Lévi-Strauss. The richly detailed and meticulously drawn design is composed in mirror image in both the horizontal and vertical directions. An empty black-ground rectangle lies at the centre of the field, and elegantly drawn palmettes with feathered outlines protrude into it all around. It is bordered by a surround in which convoluted diagonal botehs combine into a continuous design band. The wide end panels each contain four huge palm motifs facing each other in mirror image, separated only by their light-coloured outlines from the dense underlying network of palmettes, blossoms and elongated vines. This creates a transparent effect as though two graphic sheets had been superimposed and were merging into one. Two white-ground borders, each decorated with a vine bearing pairs of botehs, shield and fan palmettes, constitute the side finishes; the ends are designed as harlequin borders with embroidered motifs. – Several holes and tears along the sides, the fabric is somewhat fragile. Naga is a collective term applied to some thirty different tribes with highly diverse cultural traditions living in the north east of India. This ceremonial man’s shawl once belonged to a headhunter and is probably from a chieftain’s family. Very finely woven from cotton, the cloth has a black-brown central section and black-brown and beige border stripes at the upper and lower ends. It is embroidered with white cowrie shells which form twelve circles arranged in rows of four. Seven of the circles are double rings while five are single rings. Standing out sharply from the dark ground due to their light colour and three-dimensional shape, it is assumed that these striking designs are symbols of the moon and signify an iconographic reference to headhunting which always took place at night, often at full moon. The small red squares embroidered onto the field in rows consist of dyed dog hair. – Naga textiles only began to appear in the market in the 1970s, usually in India or, more rarely, in colonial Britain. A comparable shawl is in the Australian National Gallery (inv. no. 1986.1923). A further example featuring 24 moon symbols and an abstract human figure was sold at the first Poppmeier auction. – One incomplete corner, minor missing sections and repairs, good overall condition. Mounted onto fabric and attached to a wooden frame. A white-ground Naga wrap (shawl) woven from the finest cotton yarn, with a texture as soft as silk. The Naga live in the border region between India and Myanmar. In the past, they were headhunters and considered a particularly war-like people by the British colonial rulers. – The field is a large empty space bordered along the sides by perfectly straight stripes in dark brown and brilliant pink, three on one side and four on the other. The six woven shapes resembling hourglasses asymmetrically placed at the centre of the field are a specific design of the Ao tribe. – Various stains, otherwise well preserved. This small suzani of the traditional ruijo type is embroidered on a light brown cotton foundation, probably a fabric imported from India. Terminating in a pointed arch at the top and open at the bottom, the field is an empty space as in all ruijo suzanis, with small blossoms protruding into it from the sides. The style of drawing of the floral designs in the wide vertical borders and the section above the arch, together with the palette, the detached diagonal flowers of the outer border, the embroidered seams and the embroidery technique using chain stitch are all indications of a provenance among the Uzbek Lakai tribes. The suzani was probably made in the vicinity of Samarkand. – A few tears in the field have been backed with fabric, minor holes. Backed with a white fabric.